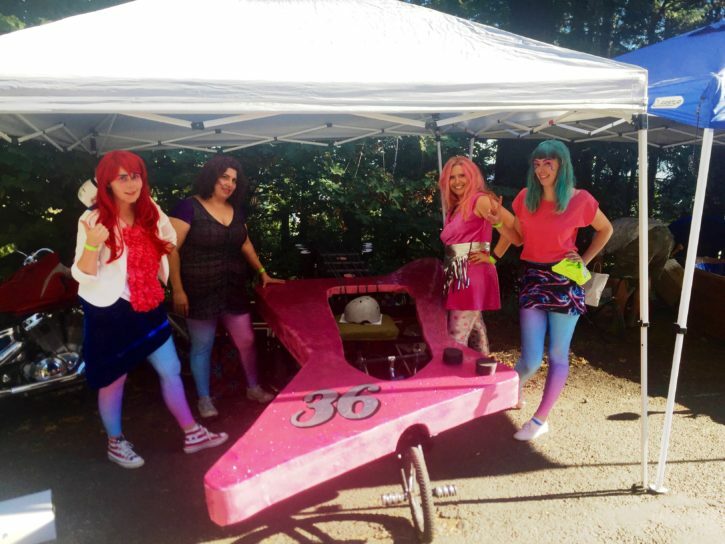 On Saturday my friend and I raced in the 19th Annual PDX Soapbox Derby in our Jem & the Holograms themed car. It was a glittery pink guitar. 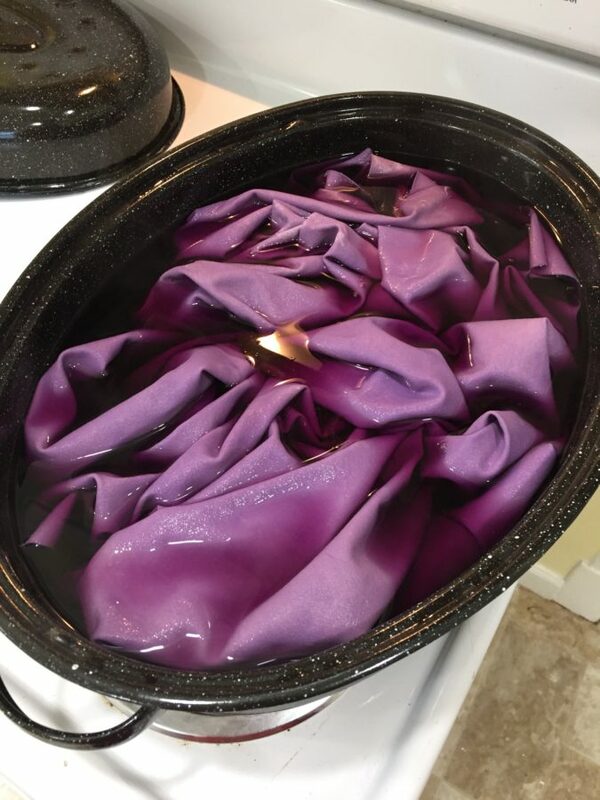 I was crossing my fingers that there was some nylon in there so I could dye it..and there was. Yay! I hacked the Cashmerette Concord tee into this dress. First I lengthened it into a dress and cut out the front and back in my purple fabric. Then I cut the front into 1″ strips below the bottom of the neckline and spaced them out by 1″ – essentially doubling the length. 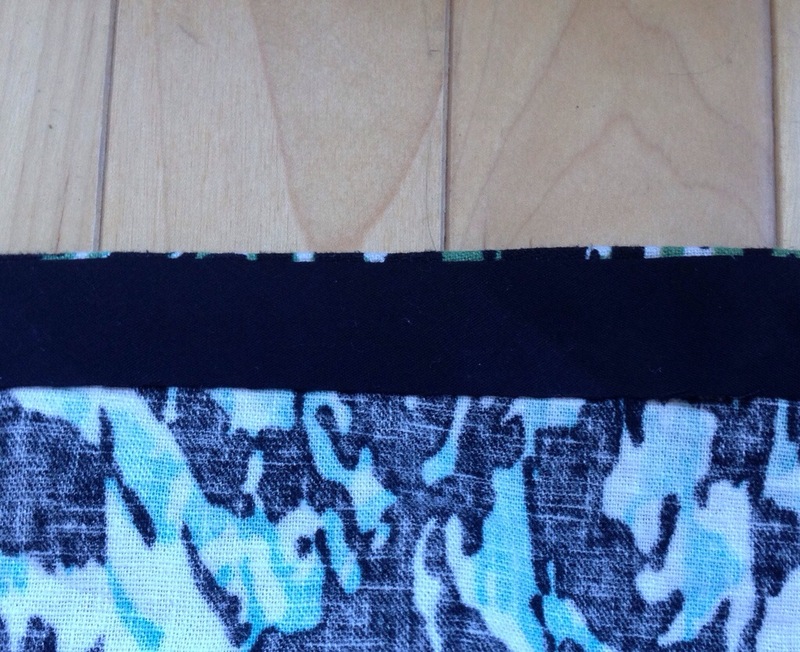 I did a wide zigzag over 1/4″ black elastic along the center front and about 3/4″ from each side seam. 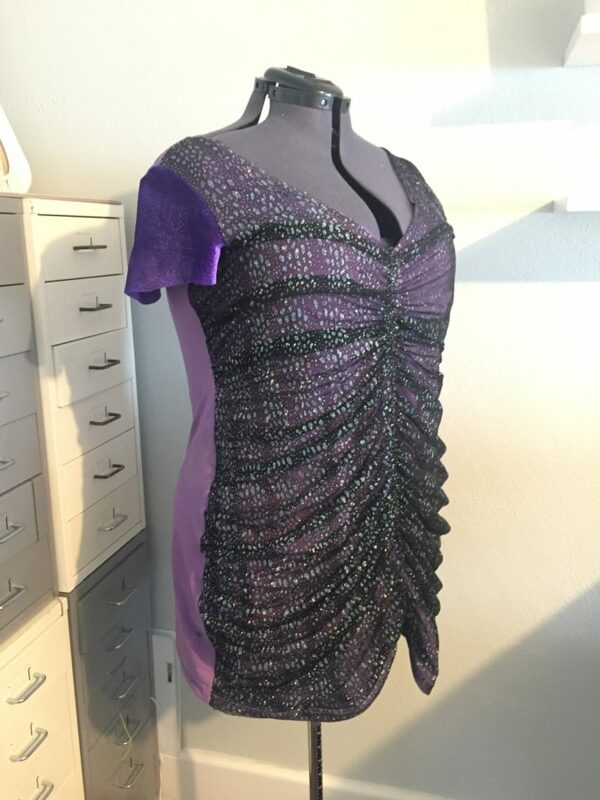 I basted the ruched front piece to the purple front piece and sewed it together to the back as one. Then I pulled the elastic out of the sides, but left the center elastic in. This let me adjust the gathers to where they were more flattering. 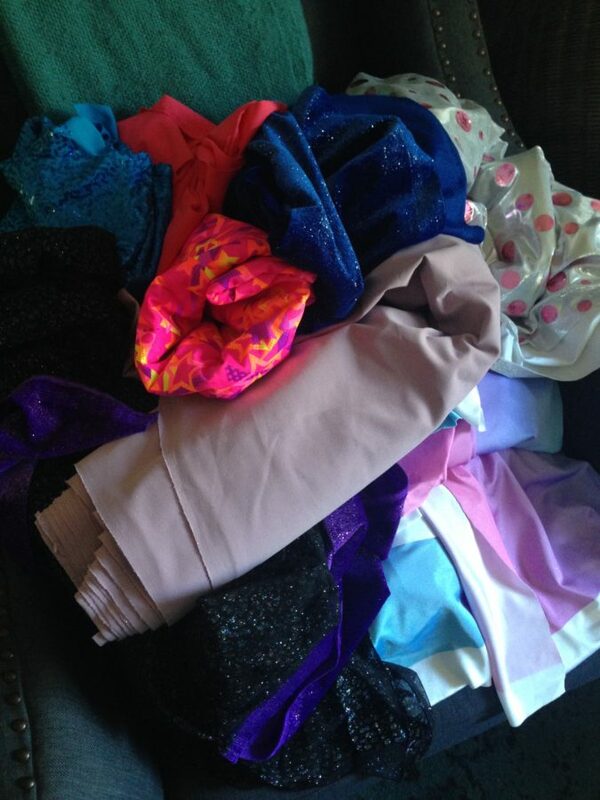 I added on the purple velvet sleeves – you’ll see sparkly velvet on all of our costumes. I liked the unfinished edges so the only finishing I did was turning up the bottom hem. This ended up being way more flattering than I expected. For Jem’s dress I used pink sparkly velvet and the full skirted option on New Look 6301. Because the velvet was thick I sewed the neckline and sleeve finishes as bands. I made the belt from some faux leather from Joann. For Aja’s costume we only had a small piece of that awesome metallic print for her skirt. So I drafted a skirt with an aqua velvet yoke/waistband to maximize it. I used Cation Design’s free Dolman Sleeve top for a starting point, but I omitted the sleeves, removed the bottom band and shortened the length, and widened the neckline. Cimberly made herself an awesome Kimber costume. 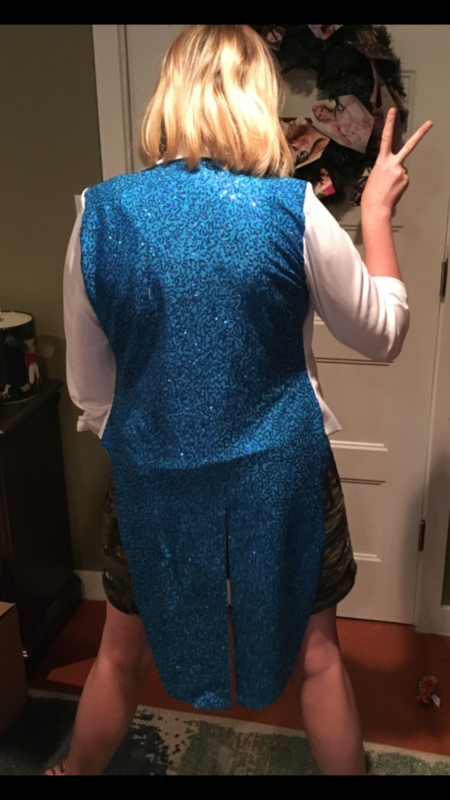 She found a basic white blazer at a thrift store and removed the lining and replaced the back piece with tails cut from an awesome blue sequined fabric. She also added hot pink ruffles to a tshirt and made an asymmetric skirt from royal blue sparkly velvet. To unify our look, aside from that sparkly velvet accents, we all wore leggings. I made everyone’s leggings using Cake Patterns Espresso leggings. Everyone was stoked to have custom fit leggings made for them. I love that they are so quick and easy to make. 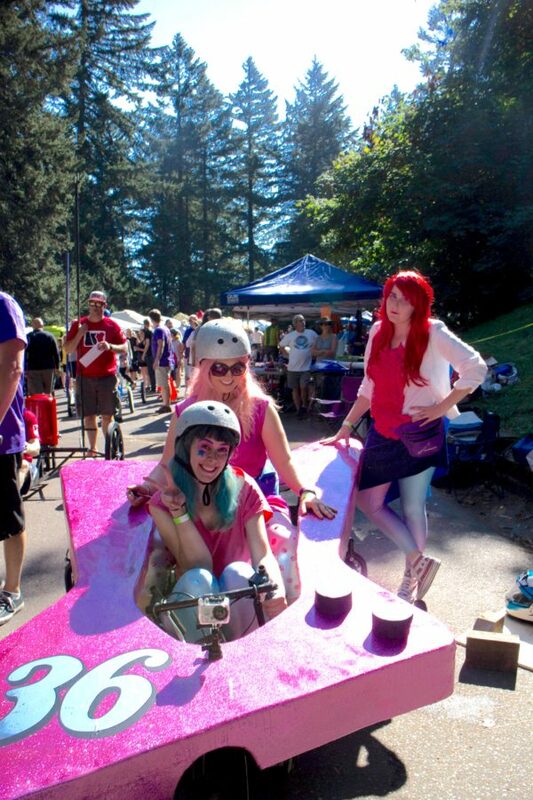 Cimberly and I also covered some helmets with holo glitter so we would be extra blinding in our races. 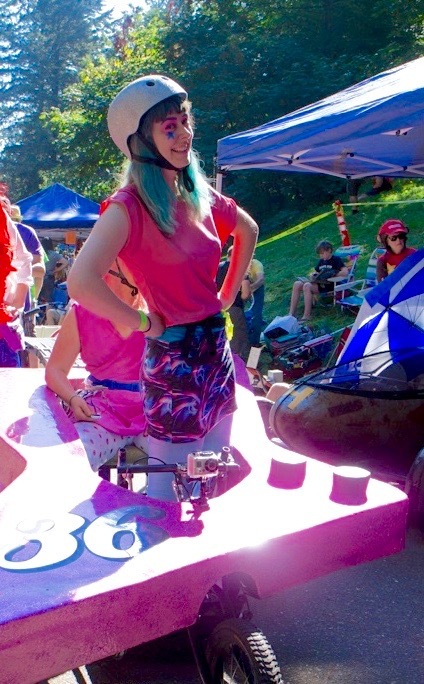 Oh…and we built our car too! Want to see how our race went? Watch our video! It was a really fun day despite it being ridiculously hot! Everyone loved our car and tons of little girls wanted to take photos with us, which we loved as the only all women team in the derby. My only gripe is that the team who won best costumes had store bought costumes (Elvis, Spiderman, mermaid). It’s always disappointing in any sort of costume contest when the judges don’t take into consideration that some costumes are handmade. I wasn’t exactly planning to participate in Sewcialists’ Oonapalooza – Oonapalooza is a month dedicated to sewing inspired by Oonaballoona. However when I was in JoAnn’s and spotted this awesome multicolored zebra print linen…let’s just say I was inspired. 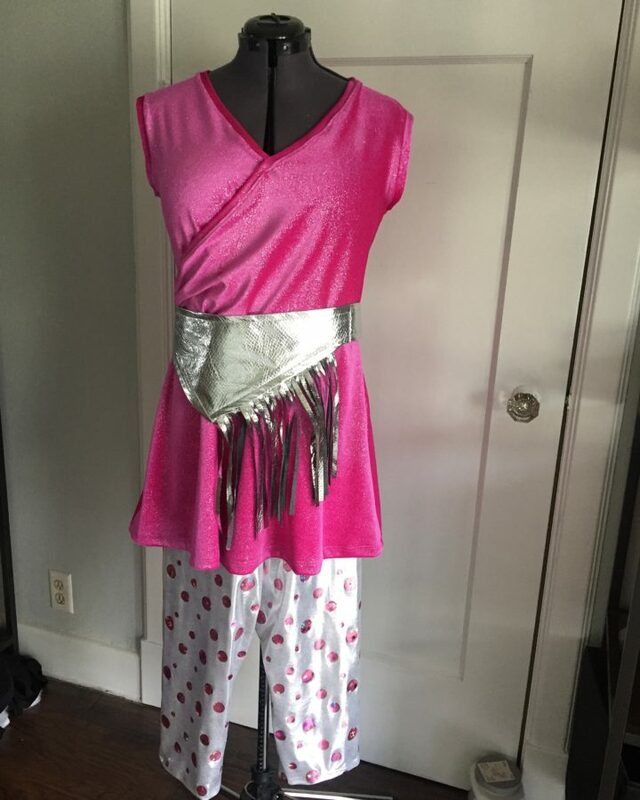 My original intention was to sew some pants, but that was nixed when I realized the fabric was not 60″ as I thought when I purchased it. Oops! I draped it on my dress form and realized I did not like this fabric as a dress. But a skirt? Yes a long skirt would work! 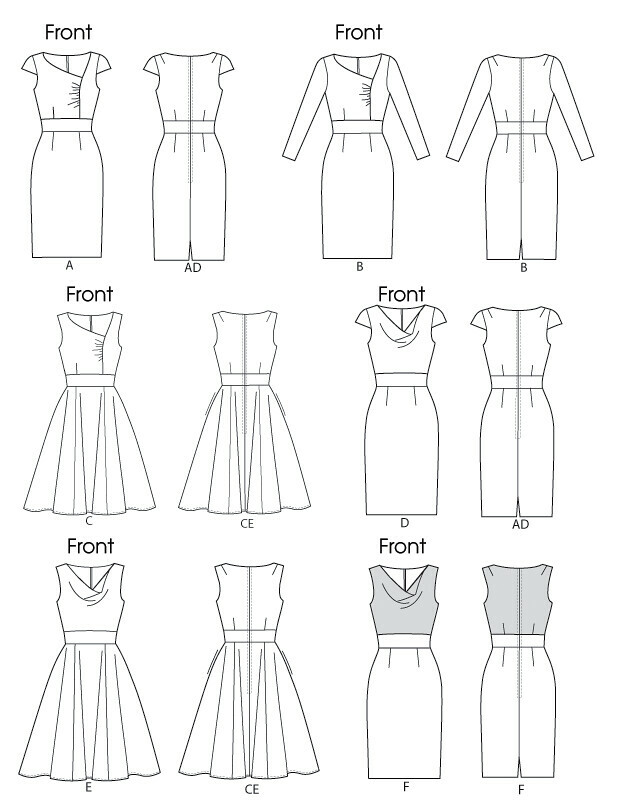 Alas, I did not have a long skirt pattern…or even a flared skirt pattern So drafted my own! I used the instructions in Skirt A Day to make a basic sloper and then created a flared skirt from that. I only made it knee length and extended the seam lines when I was cutting it out to make it max length. WIth trying to match up my “stripes, I wasn’t able to cut have much of a hem allowance so I ended up using single fold bias tape to do the hem. I actually really like the way this looks and I may use it again in the future..even on skirts with proper hem allowances! There’s a back zipper and with a tab and hook. I started off with pockets but they were distorting the side seams and making me look oddly shaped…I mean more so than I already am…so I took them out. 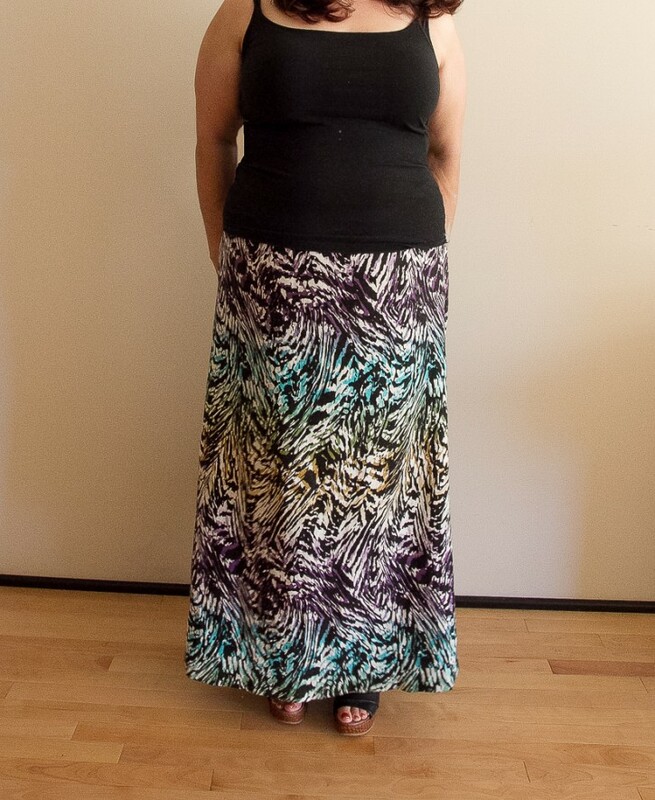 I’m very happy with my Oona Maxi Skirt. It’s perfect for this hot weather we’re getting in Portland. So nice and easy to throw on a maxi skirt and a tank top and look put together! I was in Jo-Ann yesterday to pick up some black thread cones for my serger, when I decided to look for some fabric for a Thanksgiving skirt. 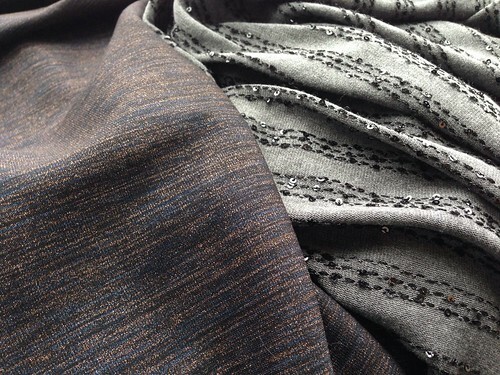 I ended up picking up 2 amazing fabrics. The first thing I found was this drapey grey knit fabric with black sequins. It was $11/yd but I had a 40% off coupon. I have no idea what I’m going to make but I much I got 4 yards. Then I was looking for some fabric to make a Liesl + Co Everyday skirt and I ended up grabbing 2 yards this thick metallic heather knit fabric. It was 50% off so I paid around $7 per yard. When I got it home I realized it was too awesome for a mere skirt and started looking for dress patterns. I think I’ve settled on making Vogue 8787 view B. Thankfully Vogue Patterns go on sale for $4 at Jo-Ann on November 23. This article was originally posted on Craftcake.com on November 18, 2013. I am planning on reposting most of my existing sewing related content from Craftcake on this site.